There has been something of a bad smell around the FIFA Executive Committee’s decision in 2010 to award the 2018 World Cup to Russia and, especially, the 2022 World Cup to Qatar. Even by FIFA’s inglorious standards, it seemed patently odd that the host of the world’s biggest single sport event would be a nation of two million people with little standing in the game and temperatures at game time exceeding 40C. FIFA told surprised observers that Qatar got the World Cup purely on the merits of its bid, and that in-stadium technology would enable the players to run around in a very comfortable stadium temperature of 22C. When many remained unconvinced, FIFA president Sepp Blatter intimated that this was colonialist resentment towards a developing football power. Still, the doubts could not be dispelled. There were persistent suggestions that FIFA Executive Committee members and host bidders exchanged more than just technical data and business cards. Things became more complicated when Qatari Mohammed bin Hammam, president of the Asian Football Confederation (AFC), challenged Blatter for the FIFA presidency. Bin Hammam found himself charged by FIFA’s Ethics Committee with trying to bribe voters. He withdrew from the election, was banned for life from FIFA, successfully appealed to the Court of Arbitration for Sport (which found insufficient evidence), only to be banned again for life on grounds of “conflicts of interest” while AFC president. Blatter was overwhelmingly re-elected as FIFA president in 2011. After this, Jack Warner, FIFA vice-president and president of the Confederation of North, Central American and Caribbean Association Football (CONCACAF), who was also being investigated by the Ethics Committee, resigned from all his official positions in football. An alleged anti-Blatter presidency conspirator with bin Hammam, Warner was now off the scene. This did not mean that all had gone quiet on the FIFA front. Blatter was dogged by court proceedings and investigations by FIFA and the Council of Europe concerning his knowledge of corrupt payments to FIFA officials by its collapsed marketing partner, ISL. Although the Council of Europe found it improbable that Blatter “knew nothing” about the millions of dollars that changed hands, the major casualty of the scandal was former FIFA president and later honorary president João Havelange, who resigned for “health and personal reasons” after it exposed him. 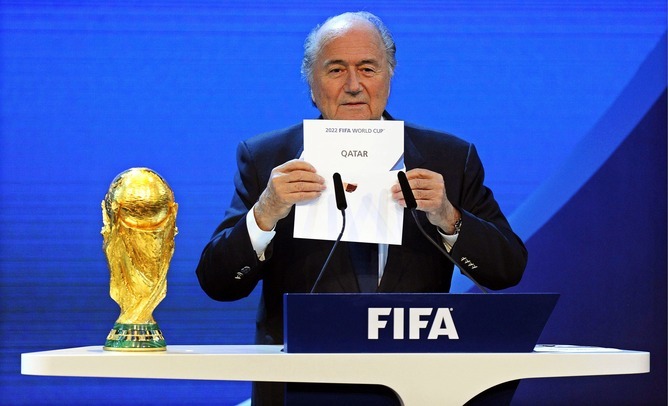 Yet the rumblings over Qatar 2022 continued, with revelations of ill-treatment of foreign workers building the stadiums and suggestions by Blatter – who had admitted that the decision was “a mistake” – and others that it might be moved to the Middle Eastern winter. Pushback from the major European and South American club competitions and threats to sue for compensation by losing bidder Australia followed, as well as a senior FIFA official declaring that the World Cup would not take place in Qatar. The ground continues to shift, and likely still will despite the new report. Football Federation Australia, which voted for Blatter in 2011, still has questions to answer. As the ABC’s Four Corners and the FIFA report have highlighted, the bid cost more than A$45 million and used consultants with dubious reputations in an attempt to garner votes. So, is there any prospect of finding an exit from the FIFA labyrinth – or even of sending the bulldozers in? Blatter promised to reform the organisation but, at the age of 78, has confirmed that he will stand for a fifth term as FIFA president in 2015. He will almost certainly win. If he does so, the labyrinth will become even less navigable. The author of the Bond novels would surely have found continuing inspiration in FIFA’s outlandish plot turns, which would have beggared even his fertile imagination. For FIFA, it seems, Scandals Are Forever.